One of the things I love most about where I am in life, is that I have so many opportunities to set a good example in the way I run my home. I try to set an example with what we grow in the garden, what we store in the pantry, and what we save in the craft cupboard and sewing room. Much of that activity, is largely guided by my own memories of my Mum, Nanna and other significant adults, in my own life, and the wonderful example they set for me. In this day and age of chasing eternal youth and the next notch in our belt as far as fitness goes, of houses that are bigger than big, and credit card debts to go with, and retirees busy spending the kids inheritance, I think it's important to remember that there was a time when adults really did, set the example. When I was a child, the adults around me worked hard. And by that I mean physically hard, not in an air-conditioned office. Dads and Grandads, and Mums and Grandmas all worked very hard to establish a comfortable lifestyle, and their idea of comfort was very different to ours. If you had a roof over your head, a Kelvinator fridge with a tiny freezer just barely big enough for a 'brick' of ice cream, and a cozy bed, you were doing just fine. TV was a luxury, and even when it became more commonplace, they were tiny things about the size of a modern day microwave. And the pictures were black and white. Television broadcasting commenced at 9am with Romper Room or Playschool for the children, and halted at about 9pm after Pick A Box and Alfred Hitchcock Presents were over. We were then treated to a holding pattern on our screen, and a high pitched hum that woke many of us from a peaceful slumber on the couch. The Milkman, The Fruit Man, The Baker, The Soft Drink Man, The Fishmonger, The Butcher and The Grocer all delivered, or had a truck that did the rounds every day, and you'd just wander down to have them weigh what you needed in their big swinging scales. They always threw in a bit of extra, be it some imperfect apples, or an extra fish, or the shank from the lamb, and garnered a loyal customer base in the process. No haggling. It was respect both ways. Everyone grew stuff and many kept chickens. I don't recall ever in my life living in a house that did not have at least a Mango tree and a Macadamia tree, and usually there was a Mulberry, a Lemon, sometimes a Peach tree, and often a Banana tree. My childhood knew no pre-packaged snacks apart from a very occasional packet of chips and that was usually in a showbag (also known as a sample bag) from the annual Show, which was like a sort of Carnival on steroids and greatly anticipated. No theme parks back then either. Afternoon tea consisted of an hour of grazing on what grew in the back yard. Sometimes that was an hour spent cracking Macadamia Nuts, sometimes it was picking Chokoes and steaming them to enjoy them dripping in butter, salt and pepper. Never did it mean something in a plastic cup, unless it was a Tupperware cup with cold, icy milk and 3 spoonsful of Milo. You'd get the Milo barely wet with milk, by stirring it in, then enjoy eating the crust of Milo granules that would settle on top. My grandparents had a Strawberry farm and picking the berries was back breaking work and they didn't earn a lot of money from it. But they also grew a choko vine, a passionfruit vine, a fig tree, and raised their own chickens, geese, cows and lambs. Grandpa would be up early to milk the cows. Nanna would rise and make Semolina for breakfast, and she'd serve it with a little of the top cream from yesterdays milk, brown sugar and cinnamon. She'd spend the morning collecting the eggs, pruning things in the garden, baking, and even sometimes slaughtering a chicken for the dinner pot. This would entail a process that would send some of you screaming from the room if I were to detail it, so I'll keep mum on that one. Suffice to say, I certainly understood the Food Chain from an early age! Nanna and Mum both cooked, sewed, embroidered, knitted, crocheted, baked, made amazing cakes for birthdays, christenings and weddings, grew food, grew flowers, made do, made from scratch, and generally conjured up life from nothing more than fresh air and water, or so it seemed at times. Not for them fretting about lines, or freckles, or excess weight, or what their resting pulse was, or who knew who and what their 'connections' might be. Yes, they looked after themselves, but it was a less conscious thing. Exercise routines were embedded in their day, so no gym membership was necessary. As far as occupations went, nobody cared if your were a doctor, lawyer, tinker or tailor. In fact, mostly people felt sorry for doctors as they were frequently called upon at all hours to tend to all injuries both great and small. Emergency treatment in big, shiny hospitals was a few years off. I still remember when an accident at the local train station had the adults talking in whispers for a full week. Our doctor was asked, with no support or well lit hospital operating room, to tend a man who was so badly injured, he would not survive. I don't think he was ever his jovial self again after that. Life was cruel sometimes. Teachers were a bit scary, headmasters more so. The local Methodist priest, scariest of all. But relatively speaking, the strange occupational hierarchy that exists now, was a long way off. Back then, so long as you paid your bills and were a good, decent person, that was enough. Mums and Nannas, Dads and Grandpas, neighbours and teachers were, and continue to be, my example in life. What worthy examples they turned out to be. As I move into the latter half of my life, I find I am more and more drawn to simpler living, and a way of life that upholds the lessons learned at my Nannas knee. Perhaps it is the pleasure of spending time with my own grandchildren that transports me so fiercely and vividly to my own childhood, and beckons to me invitingly. Whatever it is, I am determined to ensure that I live my life as an example. Not by collecting accolades, awards and celebrity status, but by demonstrating the joy of a life that is unencumbered by the expectations of others. A life that says something about who I have been in my time on the Earth. What sort of example are you setting? My granddaughter has visited for Sleepovers twice in two weeks. Both times, I gave her my undivided attention. I remember my Nanna giving generously of her time to me at the same age. She died when I was 11, and I miss her still. My memories of her have not faded one bit in the ensuing 46 1/2 years, and I feel her example in my life, every single day. From rising early, to baking from scratch, to growing figs and mulberries, and teaching my granddaughter to embroider. She is right there with me. Likewise, Mum, now gone nearly 15 years, was a teacher of so many important life lessons. The one that said don't live beyond your means. The one that said that friends who want you to spend money you don't have, be it on clothes, cars, homes or gifts, aren't friends. They're competitors in some weird life game, that you shouldn't feel compelled to participate in. And the one that said, no matter what it was, We Can Make That Darling. And she was right. Already my 17 year old daughter makes gifts and cakes for her friends as seen here above. This gift was 100 Happy Thoughts in a jar, some individually wrapped chocolates, a sweetly customised wrapped soap, and some dried rosebuds. How beautifully she wrapped it too. 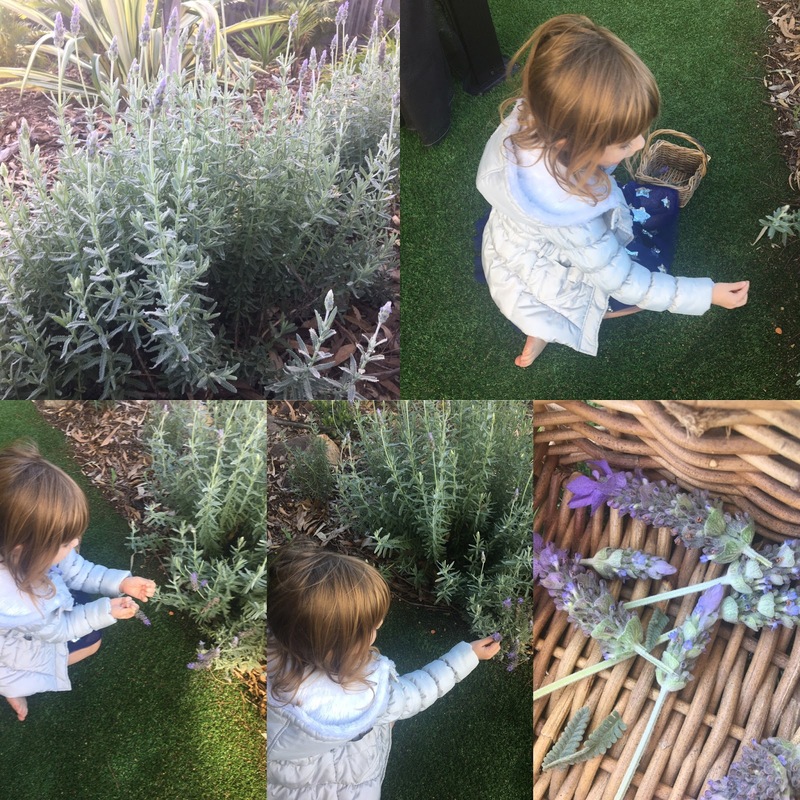 My eldest granddaughter who is 5, loves nothing more than to bake and pick flowers in the garden when she visits. Exactly as I did at her age with my Nanna. What a joy it is for me, to recreate that experience for her and my younger granddaughter, her sister. ...and she loves nothing more than to imitate what I do. Her hand embellished dinner plates are a joy to behold, and she tried so hard to imitate my kitty kats above. And finally, she tells me it's time for a cake and a cup of tea, and brings me a book to read. We don't go out for gourmet meals much either. Sure I can rustle up something pretty swish when the mood takes me, but mostly it's simple, tasty, and warming at this time of the year in the Southern Hemisphere! Corned beef and roast vegetables one night, becomes Corned Beef Shepherds Pie the next. The lesson of planning the meals to ensure minimal waste, another wonderful example. Fast food here means tinned beans forming the base of a Winter Stir Fry, with the addition of bright vegetables, cubes of Chorizo, and a little seasoning. Ready in 7 minutes. That's less time than it would take to drive to the local takeaway. Excess fruit becomes jam, which in turn becomes these gorgeous Crostadas, enjoyed as dessert, afternoon tea, and gifted for a housewarming. One simple recipe, used three times, three different ways. And at a cost of around $1 for 12, a real lesson in the value of home made. We'd seen similar Crostadas, one third the size, in a posh deli that day, at a price of $13 for 12. Even the basic lesson of serving food on nice platters is an important one. You might notice that whilst restaurants serve meals on large plates, usually only the very centre is utilised, allowing for lots of space around the food to enhance the presentation. Large plates aren't for filling up with unnecessary calories. They're to give you space to make the food look appealing. A little lemon zest, a sprinkle of chopped chives, a spring of rosemary, a dusting of paprika or freshly ground pepper. These things go a long way towards giving your food that restaurant look, without the price tag. I don't think my Nanna and Grandpa ever visited a restaurant in their entire life. But they knew the value of a beautifully set table. Mum and Nanna also knew how to make just about anything. There was no internet, but women talked. Over the fence and at church mostly. Recipes were exchanged, hardships shared, love celebrated, and tragedies grieved. Foods like Cottage Cheese were a by-product of a simple life. If you had excess milk from your cow, you had to find a way to use it. Someone else's Nonna or Nanna or Ya-Ya always had the recipe you needed to use up what you had too much of, or to stretch what you needed more of. When you realise that you can make Cottage Cheese/Ricotta, from nothing more than milk, salt and either lemon juice, vinegar or citric acid, you'll be wondering what's with the hefty price tag. Especially when you realise it's something that came out of avoiding food waste! Here's how I made a cup of delicious, creamy cottage cheese of my own the other day. My granddaughter helped. She didn't appreciate the cheese, calling it Yucky Nanna, but she loved the process. To one litre of Reduced Fat Milk, I added a 1/4 teaspoon of salt, and 1/3 teaspoon of Citric Acid. You can find Citric Acid in the Baking aisle with things like Baking Powder. Line a kitchen sieve with muslin or paper towel, and set it over a jug or bowl where the whey can drain. Bring the milk and additives to a fast simmer, and remove it from the heat. Let it sit undisturbed for 10 minutes. It will form curds which you then scoop out with a slotted spoon, into your waiting lined sieve. Keep the whey if you wish. It makes great skin toner, and can be added to shakes, smoothies, chutneys, and sauces. I sometimes keep it, and other times I don't bother. It doesn't keep indefinitely though, so make a plan to use it up, or discard as you see fit. Allow your curds to drain for up to one hour. I changed my paper towel three times to get my cottage cheese to this consistency. This is quite firm and scoopable, and I can add herbs to it and use it as I would feta, haloumi, or grated tasty cheese. Chopped mint and chives makes a lovely fresh tasting cheese. ..and as a sautéed vegetable medley the next. Planning to use things up, like the corned beef I mentioned above, is an important example too. Waste not, want not! These two meals used exactly the same ingredients, but one was served cold with the mushrooms marinated as a salad, the other stirred in a hot wok for a few minutes as a delicious Saute`. What lessons did you learn at your Grandmothers knee? Dear Mimi, Because of your Grandmother and Mother you are now able to teach your daughter and Granddaughters skills and ways that will affect their own grandchildren. Who would want to miss this opportunity? But many do. Your Grandchildren will be saying what you are saying now about your wonderful Nan and Mum, only it will be about you! I had no grandmother's knee to learn at, yet I thrive on hearing these stories from people like you!! You are kind to share with us of your experiences! I love it! Thank you for the lovely trip down memory lane. We share much of the same experiences. I, too, am blessed to come from a long line of women who set the example. Every time I work in my "victory garden" I can see in my mind's eye my grandmother teaching me. Encouraging and setting the example for our children, grand children and even young people who aren't related to us is a priceless gift to give. Loved this post, Mlmi! "In this day and age of chasing eternal youth...." THAT quote sums up for me how I've been feeling when I see some of my old friends facebook posts. When a woman's life long ambition is to 'be pretty', something is off. I love this post; it holds so much truth. It almost made me cry, while longing for the old days. I hope I can provide a little of that to my grandchildren. What a wonderful world I dreamed in when reading your post. So lovely. Dearest Mimi! You have said so many things dear to my heart! Oh to leave a sweet legacy to my grandchildren is what I desire the most! Bless you dear one. Very well said! I learned from my grandmother that women don't need school education, I learned that people of color were unhealthy and I learned to despise un-christians. I have since then learned many things my grandmother didn't want to know about and the world is a better place for it. Sentimentality easily becomes escapism and to nobody's benefit. Dear Mimi, Thanks for all the time and effort you put into sharing this lovely blog with us. It is like sitting down for a chat with a friend. I relate to so much of what you say and sometimes the memories come flowing back thick and fast. Your photos are beautiful and you have a lovely way with words. I absolutely adore the way you write about your memories of your Mother and Grandmother. This is the way it should be although unfortunately for some, it isn't. As adults, most of us are fortunate enough to be able to make our own choices in life, so we can steer our life in the direction that we would like to see it go. I think it's important to have a guidepost to see the way things can be and the beautiful memories that can be created for our children and grandchildren when we live our lives this way. I am grateful for your kind and generous nature that you give your time so freely to share your life with us. My grandparents home was my favorite place on earth. Throughout my life, I lived with them for years at a time. My parents lived in eternal self-created chaos of being....disorganized? I'm not sure. My dad was forever trying to buy himself happiness and that meant my mom having to leave home and go to work, take care of kids, the house, etc. without a lick of help from him. Thus, chaos. Grandpa worked and Grandma was a housewife. We lived in Los Angeles in a very blue collar neighborhood of small bungalows. The house was immaculate and always in order. Schedules were followed daily. At 4:30am, Grandma was making flour tortillas (we're Hispanic) in anticipation of Grandpa coming home from his all-night job. When I awoke, about 5am usually, the house smelled delicious. I watched Sesame Street & Romper Room daily and Grandpa made me so many of the *toys* they used from items in his garage. A cardboard car to race around the house in, stringed cans to walk on, & others. He taught me how to make spinning wind ornaments from milk cartons. Grandma did all the traditional handiwork and always encouraged my crafting & creation. She taught me a mean game of Rummy until I could beat her by age 11, much to my family's astonishment!! I would sit on a kitchen stool and watch her sort dry pinto beans from a big 50 lb. sack, whir hot red sauce in the blender while she wore garage goggles & gloves!, and roll thousands of tortillas. She taught me how to spread the masa on corn husks to make tamales and how to tie them in little knots to keep them from falling apart during the steaming process. Oh, what I wouldn't give to taste one of those now!! Despite the busy-ness and lack of money, their house was the most peaceful & homey place I ever lived. Clean, organized, always smelled good, & the yards outside mirrored the inside. There was truly a pride in the home and they did everything themselves. Thanks for the trip down memory road! I could picture it all perfectly, down to Grandma's favorite aprons!! Oh Mimi you had me sitting back, sipping my tea and wondering down memory lane. My Mum is not a great cook, but boy can she bake! I remember her doing a Chinese cookery course when I was about 15. Dad and us 5 kids devoured what she made. It was so delicious and it was the first time any of us kids had had Chinese inspired food. It was also the last time. Mum couldn't be bothered to spend all that prep time to see it devoured in five seconds flat! My own cooking skills were rather lacking until I met Bluey. His Mum could take an old rubber boot and turn it into a delicious meal. She taught him this skill and over the years Bluey has passed this skill onto the kids and I. One Grandma taught me how to sew, knit and crochet and the other taught me how to set a table and make a simple meal special. Thank you for giving me the nudge to look at these special people in my life and to remember their time with me with such fondness. I agree with the other comments about looking forward to reading your wise words and reminisences. My childhood experience was similar too and I have to say I didn't realise it in my lovely teenage stage, that the lessons were all about being authentic, resilient and resourceful. What a gift. I do think that I have been blessed to have learned these lessons. They certainly pay off and bring a contentment and confidence that is so valuable in this day and age. There are a lot of undermining messages going on that cause people to question their choices, lifestyle and looks. I can honestly say I'm happy and content with my life and that is something you don't hear a lot of these days. I loved this post so much that I read it to my husband and we sat and reminisced of our fond childhoods and grandparents lessons taught to us. We live a very simple life and are grateful for all we have. However it's not as simple and pure as our childhoods were. Oh how I wish the world for our grandkids was as wonderful as it was for us. We can and will continue to instill in them the simple pleasures of life, and satisfaction of working hard, being grateful and doing for others. Thanks again for such a beautiful post! I would say our home is more homey than trendy , my gardening skills very basic and my meals and baking is of the old fashioned kind. He and his sister can't wait until tomorrow , as They are coming for dinner , after I do school pickup.Im cookign one of their favourite meals and have done baking today, can't wait !